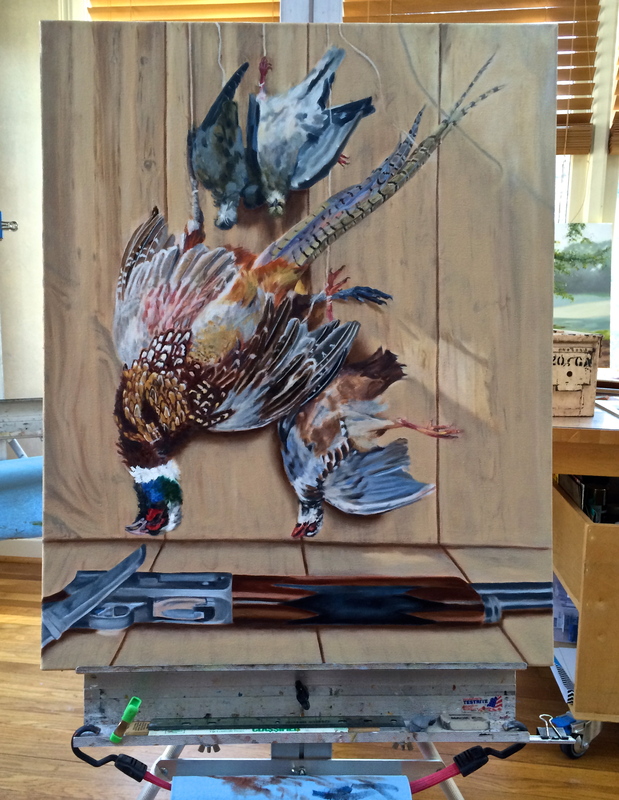 While the grass blades dry, I painted pheasant feather details, added a layer of paint to the background, and another to parts of the shotgun in Game Over. It’s overwhelming close up, with so much to do to get it where I want it to be, and no certainty that I can do it. Worth trying though. 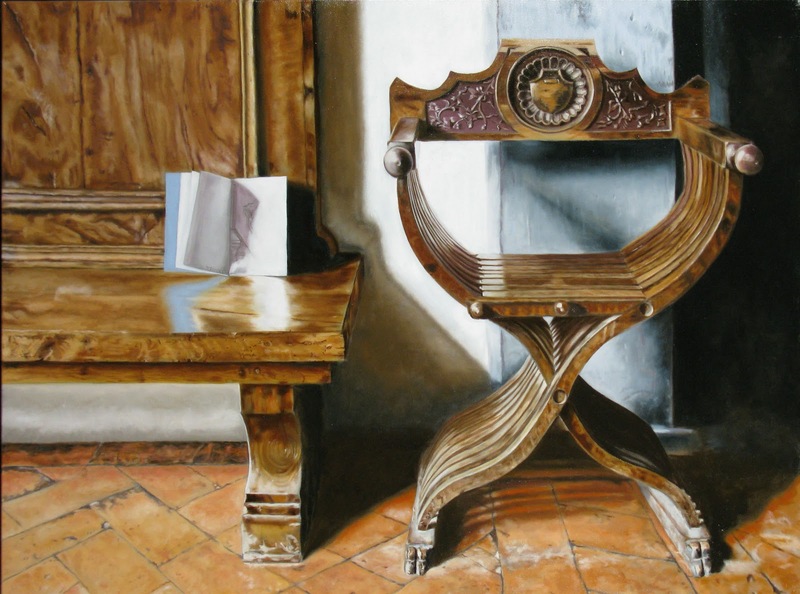 There are two more paintings mapped up, one drawn, and another I haven’t even done the source photography for yet. This series is probably going to take the rest of the year. The good news is it hasn’t lost any of the buzz, the juice for me as an artist. Deciding whether to put it out there, exhibit it piece by piece. or wait until all the painting are complete is a hard decision for me. I’ll talk to the gallery. Doing the sometimes tedious, sometimes Zen-esque addition of grass blades, seed heads and ground trash, the woodgrain, the trigger. Switched up to refine the edges of letters on the bottle labels. 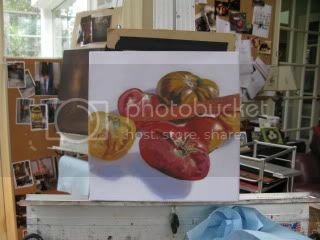 Got a call from the Swan Coach House Gallery – the tomatoes and cupcake paintings sold and they’d like a few more. Scoured the house for small works under 8×8″ and am taking over two I have not wanted to part with after I reminded myself I can always paint more. 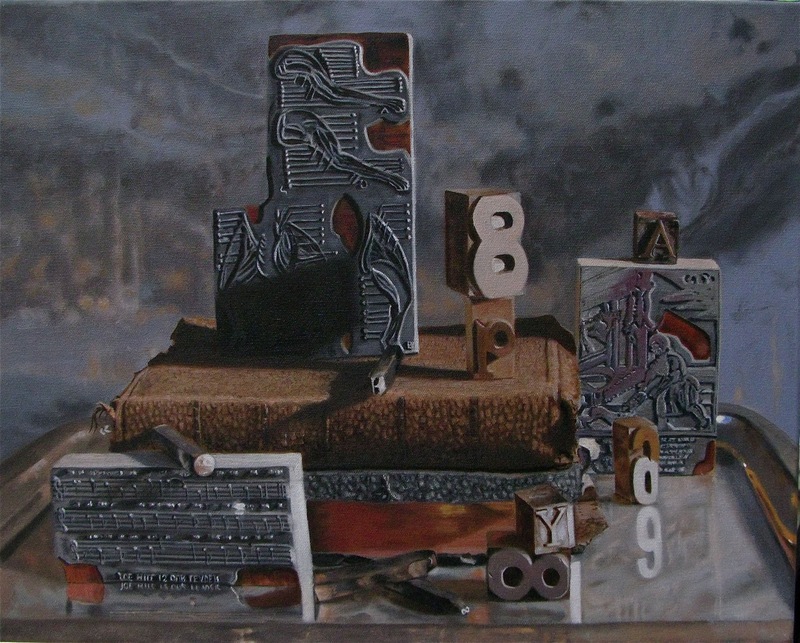 Steps and Read and both 5×5″ and oil on board. If I wasn’t heading for Boston in three days I’d paint a little cavalier. 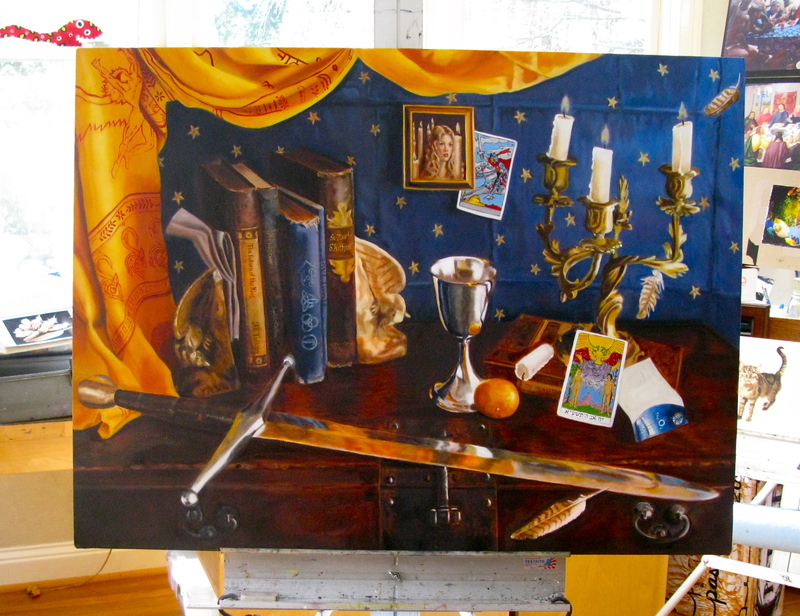 Piecing together a new still life. The central element is a Browning shotgun, a 16 gauge Sweet Sixteen, and its suede carrying case. The gun was made in 1958 and has a nice patina on the carrying case. The gun itself is in excellent condition according to the clerks at Chuck’s Firearms. 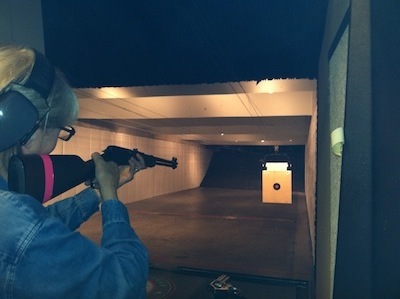 Last Thursday, I went to the gun range with the shotgun. I was assured via phone that they carried the necessary ammunition (16 gauge slugs), but they did not. Since I was already there, I tried one of their guns, a 22 rifle and remembered what I’d learned in riflery at summer camp. Though I haven’t touched a firearm since 1963, I hit the bullseye three times. It is not unlike shooting a camera. Sight, then hold your breath, and squeeze slowly. I brought the target – classic circles of black with a red center – home. It’s one of the elements I might use. I ordered 16 gauge slugs (can’t use buckshot in a gun range) over the internet and plan to go back to the gun range today (ladies day – ladies shoot free). A friend who owns a bar gave me 12 empty liquor bottles of varied shapes and sizes this morning. I want to set them up on a fallen log, as if they have been used for target practice. Have three broken and one standing. Still looking for the outdoor location I have in my mind – a broad, empty pasture or field with a fallen log and a fine tree by itself. Perhaps near a road. Another image in my mind is the target pinned to a tree and leaning the gun against the trunk. I have a recipe of fake blood from a special effects guy. I’m going to start with a very simple indoor set of pale wood panels. 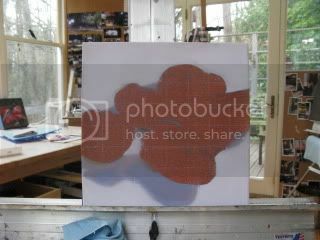 This weekend Robert built the background, using birch panels on an old metal trolley. I’m going to do one round of photos with just the shotgun, suspended in front of the pale wood, with a visible shadow behind it. 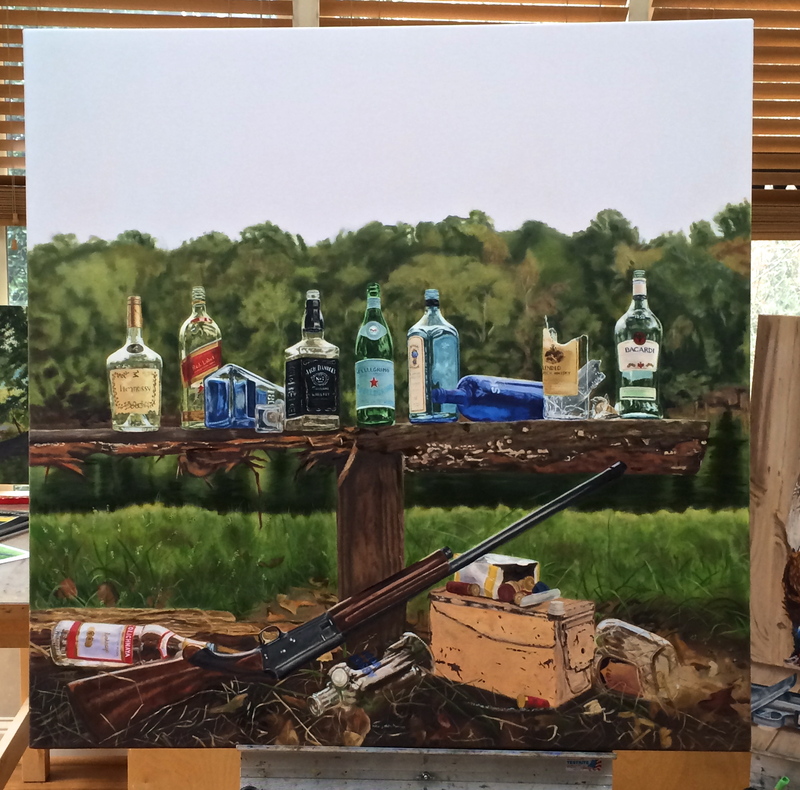 I might or might not try adding buckshot and/or smoke emerging from the barrel. I used 30 pound fishing line to tie up the gun. The hard part will be waiting for sunlight. Atlanta is doing an imitation of Seattle weather. Hunting season of both rabbits and doves is around the first weekend in November, so photos including game will have to wait until then. I wish I could find a vintage game bag – still scouting for that. 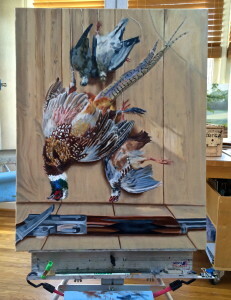 I want to do one set up with the gun, doves/quail and a hare or two. Meanwhile, I paint along on the typewriters, but feel no particular urgency. I’ve only been a paintings a few days a week, I don’t know which show I’ll put them in. November perhaps. Menwhile, this Saturday the 26th SCAA juried show opens. I had three paintings selected for the show and the best part is the judge is a museum curator. Inspired by designer Gudrun Sjoden, I dragged out an old Adirondack chair Robert found by the roadside and painted it in bold colors and pattern. I added bluebirds. Took me a couple of layers and a little frowning to remember that acrylic color dries half a value darker than it looks wet. Birds on review – first the chair for scale and overall ambiance. There are three eggs on one of the seat slats. Here’s a detail of the bird on the back of the chair. It is a tad fuzzy, but close counts. Finally here’s the chair on the deck, along with a similarly painted little church-shaped birdhouse that used to be gray. The chair is so bright, it looks like I have a flashlight on the deck. In time it will mellow. 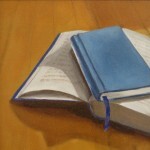 This has been great fun, and I return to my studio refreshed. 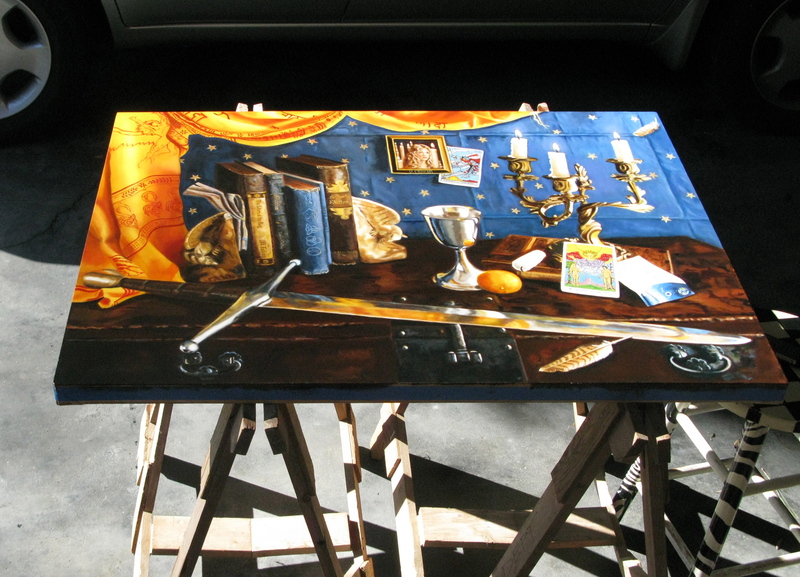 Plucked up my courage and set up for varnishing. I do it outside under cover of the carport. It has the best light by far, which means I’m able to catch any problems – dull spots, fur filaments, gnat wings – and fix it right away. 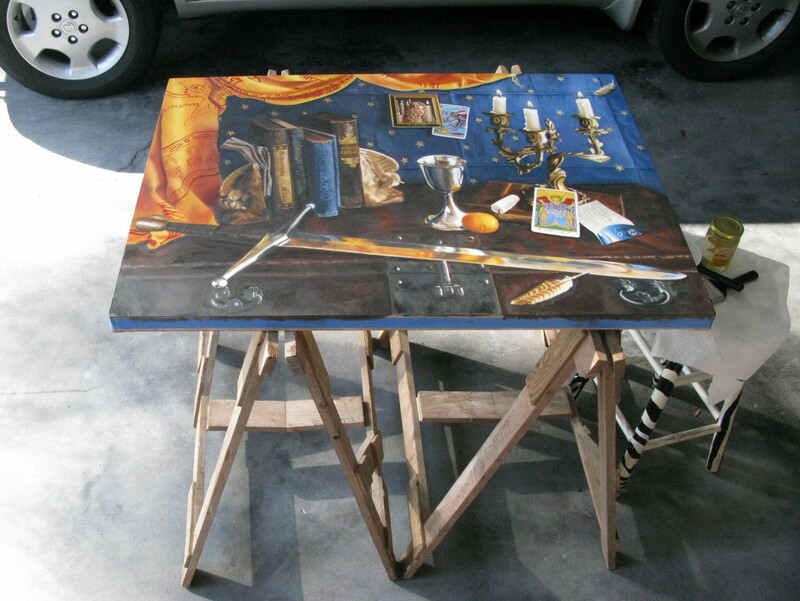 Here’s the painting, balanced on sawhorses. 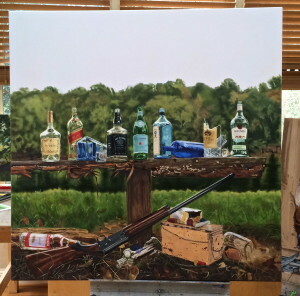 I have the Soluvar and brushes waiting on a stool. The ideal is to cover evenly and quickly, leaving no brush marks. 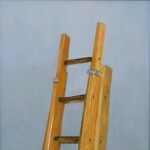 I pour a thin drizzle of varnish and follow with a sort of basket weave of horizontal and vertical brushstrokes. Here is the finished piece. I’ll be bringing it inside in another hour to finish dying. 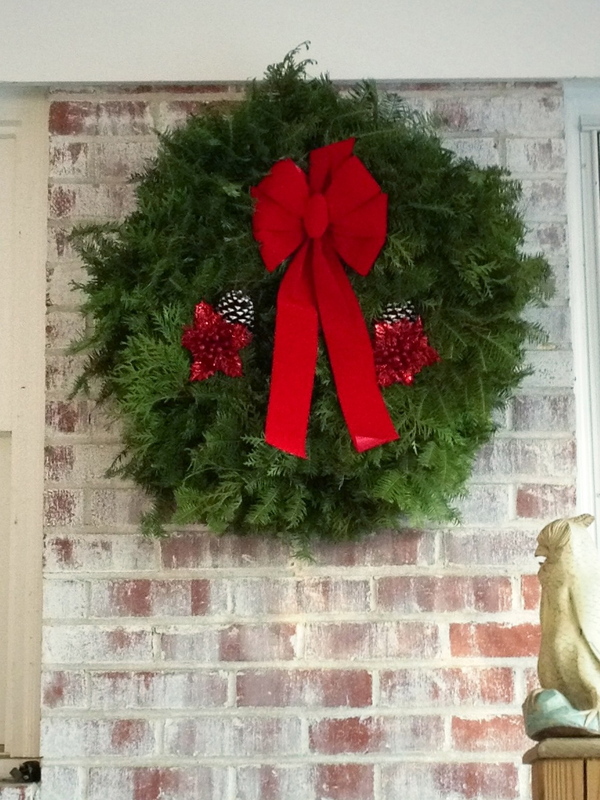 Every year we get a evergreen wreath from the far north woods of Wisconsin. It smells like Christmas and winter and snow and cold. I hang it by the back door – the door we actually use, so we can take a deep breath of snowy evenings with every arrival and departure. Off to Chicago and Glen Ellyn for four days. After a serious of false starts, I added Apollo, the winged God logo that was used for Led Zeppelin’s Swan Song record label, to the upper left of the drape. The logo was based on an a painting of Apollo, The Fall of Day (1869) by painter William Rimmer. After a long holiday layoff, during which I recovered from a major operation, took a workshop on using my iphone camera app, and painted multiple small cavalier sketches for the Swan House, I am back in the studio at last, working on tomato paintings I started last year. Today, I tackled the heirloom tomatoes and a Global knife. Borrowed that knife from the contractor who worked with me on my bathroom, a terrific woman with a keen sense of design. This morning was all about placing tomato colors. I’ve got their names written down somewhere – a Mr Stripey is all I can bring to mind. They are still floating, and the knife got no paint at all, but progress was made. Going to go pop it in the drying box.